Members of Divest Dal attend Dalhousie Board of Governors meeting in support of step toward fossil fuel divestment. February 13, 2019 (K’jipuktuk/Halifax) – At Tuesday’s Dalhousie Board of Governors meeting the Dalhousie Board committed to signing onto the United Nations’ Principles of Responsible Investing and to increase investments in renewable energy companies. 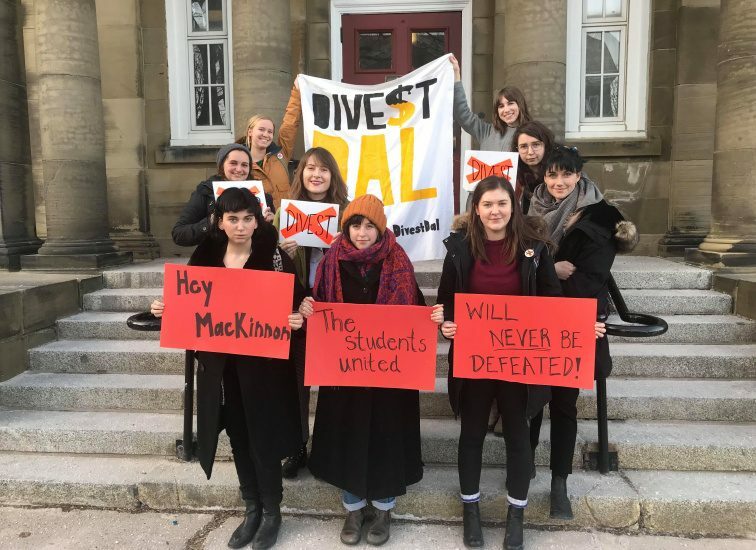 Divest Dal has been advocating for the removal of fossil fuel investments from the Dalhousie University endowment fund for the past 6 years. In 2014, the Board of Governors voted against divestment but, following a 9-day campout on the Dalhousie quad, the Board agreed to investigate options for fossil free investing. Yesterday’s decision was the result of a year-long process of assessing investment options.